Camping with Colin Ibbotson and his customised tarp and then pitching one for the TGO videos has set me thinking about tarps. 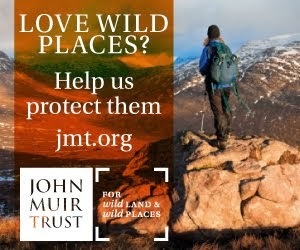 Although I don’t often use one in Scotland (and never in midge season) I have used tarps extensively in other places. For me, one big advantage of tarps over tents is more space for less weight, which is why I don’t like small tarps such as the one pictured in the last post. I like a tarp in which I can comfortably sit out a storm without needing to huddle in a bivi bag to stay dry. The pictures above show my two favourite tarps, neither available any more. The top one is a Kathmandu Trekking Basha-Tent, which weighs a hefty 794 grams (28oz) to which I added a groundsheet and pegs weighing 425 grams (15oz) for a combined weight of 1219kg. It’s an enormous tarp – you could probably pitch a couple of solo tents inside it – and I did once spend a whole day in it during a big storm in the Alps. The picture was taken on the Arizona Trail, at a very windy site. Pitched with the sides at ground level no wind entered while the big entrance made for excellent ventilation. The second tarp is the GoLite Cave 1, which weighs 397 grams (14oz). Pegs and a groundsheet double this to 794 grams (28oz). 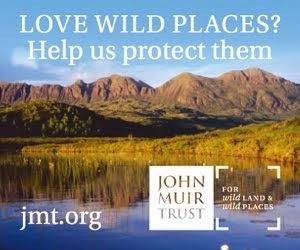 The photo was taken at a site in the High Sierra on a day when rain threatened. As there was no wind and the site was sheltered I pitched the tarp with the sides well above the ground for good views and ventilation – another advantage of tarps is that they don’t cut you off from the world outside as much as a tent. Pitched with three sides down to the ground the Cave 1 is very storm resistant. It has side guylines, which greatly enhance stability. I don’t use a bivi bag with either of these tarps as both are big enough for me to stay away from any rain coming in the entrance – which can be pitched low to the ground if necessary – and don’t let in much wind when the sides are pegged at ground level. 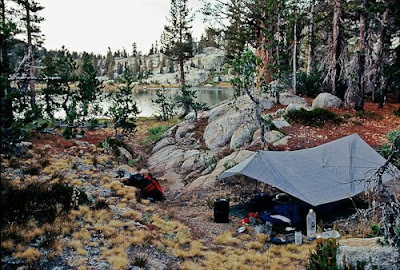 while reading the Advanced Backpacker you got me hooked on tarps back in 2004. Coming from ultraheavy gear I wanted something lighter that was still rugged, big and offered a lot of protection from the elements. I bought the Exped Scout Tarp extreme which is a really cool huge tarp weighing around 1kg. This tarp could be pitched like yours and even though I use much lighter stuff right now it´s still a cool product for people transitioning from heavy to light. The Golite cave looks very similar to Ray Jardine "Ray Way Tarp" which I am attempting to sew using his kit this year. When I get a week to myself I will try and get it made so that'll be next spring then! It`s probably identical Dave. The Cave was one of the original Ray Jardine designs that launched GoLite. It's one of the best tarp designs I've seen. Good luck with the kit! D'oh! I thought they looked incredibly similar. I bow to your supreme knowledge....I am not worthy!!! 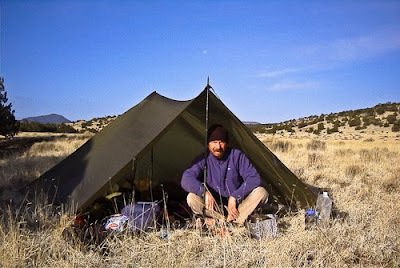 I am a pretty devoted backpacker and having a good quality light weight poly tarp to use as shelter is important. I recommend the tarps from www.Tarpsplus.com just figured I'd help out by pointing out a good inexpensive product. There's something strange about that second photo - the scale looks wrong! It looks like it's a huge tarp (big enough for several people and a table! ), in a fairly large clearing, but then you see the bottles and the pack! It must be something to do with the scale of the trees and/or the perspective I think, or with the lack of instantly recognisable references for scale. Maybe it's clearer in a higher resolution? Mark, I must admit it doesn't look like that to me but then I know how big the tarp is. The original is a transparency and this is the only scan I have so I can't look at it in higher resolution. The original trannie looks fine when projected. It must be my eyes then! Actually the more I look at it, having worked out the true scale, the harder it's getting to see it the way I first did. The mind is a strange thing, or at least mine is!! The Cave is a wonderful shelter, versatile and roomy. 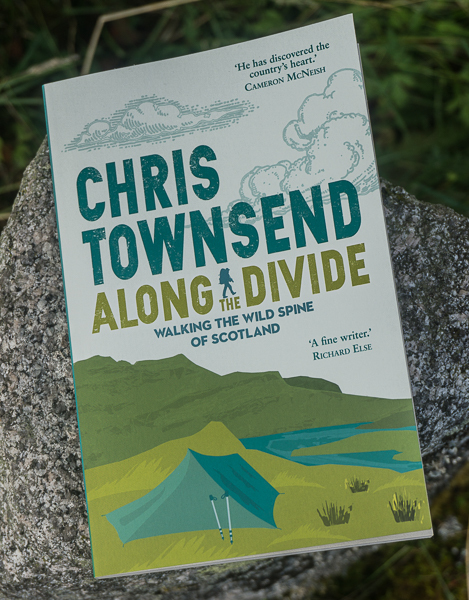 Mine did splendidly on the TGO Challenge this year, although pitched next to Colin's rather more streamlined affair it did look a wee bit primitive. Still, you can't beat the ventilation and the way a simple tarp lets you take in a wide view as you doze off; I'll accept the penalty of a few extra ounces, I think, as much as admired Colin's tarp as a piece of design. I've read your book, backpacker's handbook its excellent. I bought a tarp but I am also concerned about possibility that tarp if collapses could suffocate you due to CO2 exhaling. Have you got any experience with that? I don't think suffocation is something to worry about if a tarp collapsed. I think the effects of wind and rain would be the real concern! I've never had a tarp collapse but I have had a few tents collapse over the years but I've never felt in any danger of suffocation. He was thinking on the case when tarp collapses over the night and covers you completely while sleeping. I've also read about that on the internet, one girl suffocated after her tarp collapsed. Also two guys suffocated in their poor designed bivy. Thanks! I must admit I've never heard of anyone suffocating under a tarp and I find it hard to imagine how this could happen. People have died from carbon monoxide poisoning from running stoves in completely sealed tents but that's a different matter. I think the company disappeared well over a decade ago and weren't in business for very long. Kathmandu Trekking closed in approx 2007 , 2 years after the death of it's creator Julian Miles. It had actually been producing lightweight camping equipment for over 20 years, all of it designed by Julian. It was fantastic equipment made to last, unfortunately Julians ill health effected the business developing into what should have been a brand leader in the field of lightweight camping.